What would one of college basketball's fiercest rivalries look like on a TBT court? Happy college basketball season, everyone! With all eyes fixated on tonight's big Duke-Kentucky tilt, it naturally begged the question, what would this matchup look like on a TBT court? While there's literally hundreds of roster combinations you could put together between these two storied programs, we took a stab at it below. Have another starting five come to mind? Tweet us and let us know! Aside from Coach K himself, I'm not sure there's anybody Duke fans would rather have on the bench than all-time leading scorer JJ Redick. While countless NBA players have passed through Cameron Indoor over the years, nobody's name is synonymous with Duke Basketball like JJ. In the backcourt, we have DeMarcus Nelson and Gerald Henderson running it back together because who on earth doesn't want want to see that? Even though Gerald went on to become a Charlotte Bobcats legend and DeMarcus is still in the midst of a wildly successful overseas career, it feels like the cherry on top would be the two winning a championship together after suffering brutal NCAA Tournament upsets in 2007 and 2008. This team's frontcourt features three guys who never played a second together, which is exactly what makes it perfect. Mike Dunleavy, who was on Duke's 2001 NCAA Championship team, is a no-brainer after finishing a stellar 15-year NBA career in 2017. Alongside him at the other forward is Kyle Singler, who is arguably one of the five best players in Blue Devils history. In his four-year Duke career, Singler won the 2010 NCAA Championship, was named the 2010 NCAA Tournament Most Outstanding Player, was twice named a member of the All-ACC First Team, and finished fourth all-time in scoring with 2,392 points. Rounding out the starting five is big man Josh McRoberts, who was still in the NBA as recently as last season with the Dallas Mavericks. While at Duke, McRoberts helped lead the Blue Devils to the 2006 ACC Championship and was named a member of the ACC All-Defensive Team in 2007. With all of the talent that Coach K has brought to Lexington over the years, it was nearly impossible to select a starting five. Heck, even picking a head coach was an hour production with names like Anthony Davis, Rajon Rondo and DeMarcus Cousins all in consideration. We ultimately put a bunch of names into a hat and selected John Wall. 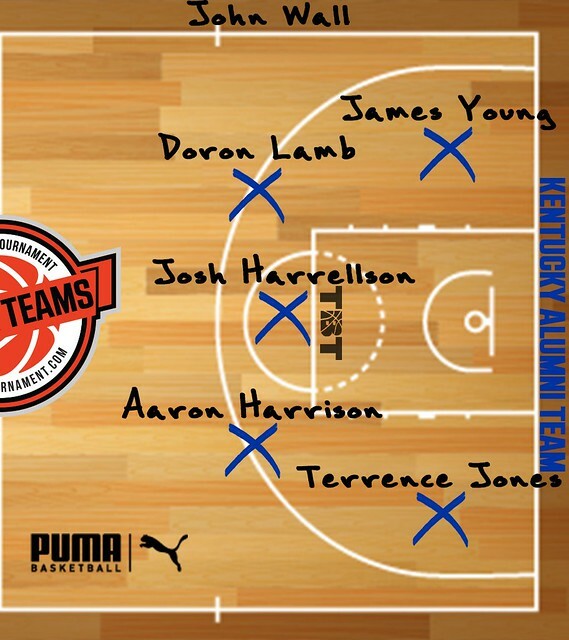 Considering that the 2012 Kentucky NCAA Championship team is arguably the best college basketball team ever assembled, Doron Lamb and Terrence Jones were immediately taken off the big board and inserted into the starting five. Another automatic entry was Wildcat legend Aaron Harrison, who hit back-to-back game-winners in the 2014 NCAA Tournament against Michigan and Wisconsin. That's exactly the clutch gene you need to win in TBT. 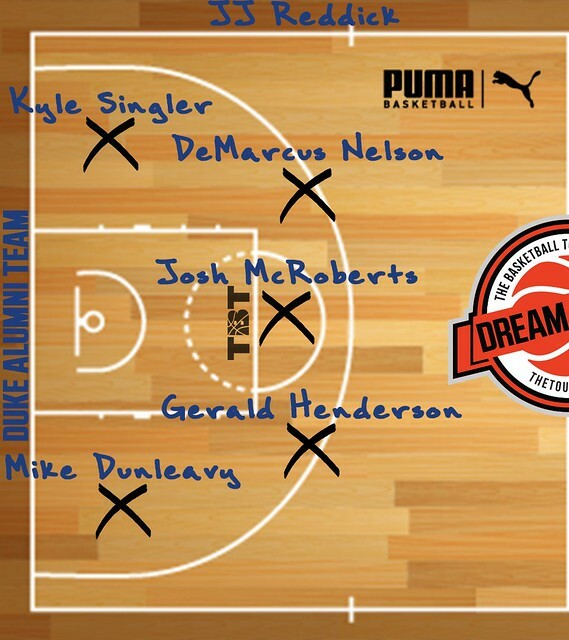 That left us with two spots left, which we ultimately filled with James Young and Josh Harrellson. Young, who only played one season in Lexington, knocked down 82 three-pointers in 2013-2014, which ranks second in UK freshman history. He has split time between the NBA and G-League over the past five seasons. Rounding out the starting five is the man in the middle - big Josh Harrellson. While his relationship with Coach Cal generated a lot of headlines over the years, don't forget how good Harrellson was on the basketball court. It was probably most evident in the 2011 NCAA Tournament, when he had a 17-point, 10-rebound, 3-block performance against Ohio State and a 12-point, 8-rebound, 4-assist game against Tyler Zeller and North Carolina to help lead Kentucky to the Final Four.